So you think pizza can’t be a part of your healthy diet, right? Think again! 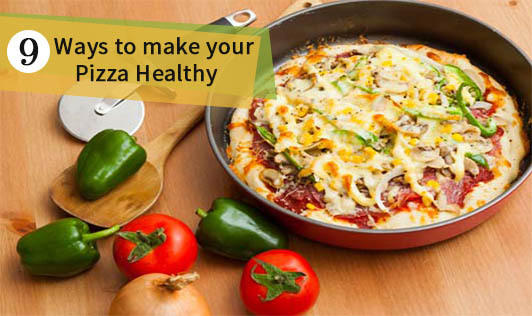 You can easily change your greasy unhealthy pizza into a healthier version with a few, simple modifications. Make your own whole grain pizza crust at home. Use wheat flour for base or just add some bran or oats to your pizza dough, to make your pizza slice protein- and fiber-rich. Go for cheese with more flavor and lesser calories by using a combination of mozzarella, low-fat parmesan, or normal store-bought cheese with grated cottage cheese or low-fat parmesan. Top your pizza with all kinds of colorful vegetables to make it more nutritious. This will help you feed kids who are normally fussy about eating their vegetables. Pizza is one such food that people mindlessly gobble down. Make sure you pay attention to the portion. Ask yourself if you really want that third slice. Instead of gobs of cheese, opt for heart-healthy options like the mushroom, spinach, bell pepper, baby corn, olive, and zucchini. Meat lovers can swap bacon, pepperoni, sausage, and fatty meat for cuts of lean chicken or chicken sausage. Bottled pizza sauces are full of sodium and other preservatives. Make your own pizza sauce at home and you can instantly improve the quality of your pizza. Don’t stick to just red sauce, go beyond it, and use other variations like pesto, olive oil, or fresh garlic for the base. Make the pizza spicy instead of greasy. Fresh chilies, red pepper, and fresh herbs like oregano, rosemary match perfectly with the subtle flavors of tomato. Top your pizza with low-fat cottage cheese (paneer), shrimps, salmon, and more. Lean protein makes pizza a super satisfying meal.